Featuring new creature comforts, technologies, and safety systems – many of which are industry firsts – the 2017 Mercedes-Benz E-Class marks a new age in luxury driving. Simply put, there are few things the new E-Class can’t do. Driver-focused, high-performing, and backed by some of the most intelligent safety systems on the market, the E-Class continues to thrill drivers in Alpharetta, Johns Creek, and beyond. Come to RBM of Alpharetta and take a journey in one of the techiest vehicles on the market: the 2017 Mercedes-Benz E-Class! The Mercedes-Benz E-Class offers a selection of powerful, turbocharged engines. The 2017 Sedans, Coupes, and Cabriolets produce up to 402 hp and 443 lb-ft of torque, while the 2016 Wagons reach 577 hp and 590 lb-ft of torque. New for the E-Class Sedans, a 9G-TRONIC® transmission accompanies the engine, while DYNAMIC SELECT® offers up to five drive modes: Comfort, Eco, Sport, Sport+, and Individual. The sedans get a lowered, steel-spring suspension with selective damping, while the coupes feature AGILITY CONTROL® – both of which individually adjust shock absorbers to tackle virtually any road condition. Using targeted rear-wheel braking, ESP® Dynamic Cornering Assist increases the directional stability and cornering capabilities of the E-Class Sedans. In addition to being inimitably luxurious, the 2017 Mercedes-Benz E-Class Sedan revolutionizes technology in its segment. The larger 12.3-inch COMAND® display comes with a touchpad controller for tablet-like operation. Advanced voice control makes finding contacts, placing handsfree calls, or powering up COMAND® navigation a cinch. Apple CarPlay® or Android Auto™ come as part of the COMAND® package, giving you full control of your iPhone® or Android through the central infotainment system. What’s more, Near-Field Communication (NFC) technology detects your phone the moment you enter the cabin, and syncs its data with the E-Class via a secure connection. The future of safety technology gets a running start inside the ground-breaking 2017 E-Class. Active Brake Assist (CPA PLUS® for all but the sedan) alerts you if you’re rapidly approaching a straight-ahead vehicle, and aids you with emergency braking. If a collision is imminent, PRESAFE® helps secure the cabin and its occupants, while new PRESAFE® Sound (sedan only) emits a “pink noise” to stifle the sound of an impact by stimulating a natural reflex within the ear canal. Car-to-X-Communication (sedan only) makes it easier to avoid hazardous conditions altogether. This new technology allows you to exchange weather and crash notifications with other Johns Creek E-Class drivers, which are easily viewed via your driver information center. Starting at $52,150, the entry-level E 300 Sedan sports a 241-hp 2.0L turbo inline-4 engine and a 9G-TRONIC® automatic transmission with DYNAMIC SELECT®. The exterior wows with your choice of Sport of Luxury styling, while the cabin boasts an outpouring of new features, including 64-color LED ambient lighting, a 12.3-inch COMAND® display, and steering wheel-mounted Touch Control Buttons. For a base price of $54,650, the E 300 4MATIC® Sedan integrates the 4MATIC® all-wheel drive system for greater control and traction. Equipped with its sibling’s 2.0L turbo engine, the E 300 4MATIC® allocates its 273 lb-ft of torque to its four wheels using a 4-Wheel Electronic Traction System and a specialized version of the Electric Stability Program. Furnished with a 396-hp AMG®-enhanced 3.0L biturbo V6 engine, the AMG® E 43 Sedan zips from 0 to 60 mph in a cool 4.5 seconds. Notable features for this luxe racer include AMG® Sport Suspension, ESP® Dynamic Cornering Assist, and galvanized shift paddles. Powered by a 329-hp 3.0L biturbo V6 engine, the E 400 Coupe is rated at 354 lb-ft of torque, 20 mpg city, and 29 mpg highway. Starting at $54,550, this energetic four-seater includes a 7G-TRONIC® transmission, LED headlamps, a panorama roof, and the COMAND® system with a central controller. For an extra punch of power and control, the E 400 4MATIC® Coupe offers the E 400 Coupe’s engine, but integrates 4MATIC® all-wheel drive with ESP® and 4ETS®. For a starting MSRP of $57,050, the E 400 4MATIC® also includes AMG® body styling and heated front seats. Available at a starting MSRP of $60,650, the E 550 Coupe comes furnished with a 402-hp 4.7L biturbo V8 engine rated at 443 lb-ft of torque, 18 mpg city, and 26 mpg highway. The E 550 Coupe differentiates itself with sport-tuned suspension, 18-inch AMG® wheels, and digital dual-zone climate control. The E 400 Cabriolet starts at $62,600, and like the E 400 Coupe, comes with a 329-hp 3.0L biturbo V6 engine that earns a 20 mpg city/29 mpg highway rating. This clever convertible uses AIRCAP® technology to promote a quiet open-top driving experience, as well as optional AIRSCARF® neck-level heating to protect you from drafts. Starting at $69,100, the E 550 Cabriolet delivers captivating ride quality with a 402-hp 4.7L biturbo V8 engine, Dynamic Handling Suspension, and perforated front brake discs with painted calipers. Brushed aluminum pedals, a flat-bottom steering wheel, and sport-contoured front seats, and other sporty details help create an experience that’s truly driver-focused. The E 350 4MATIC® Wagon is powered by a 302-hp 3.5L V6 gasoline engine, a 7-speed automatic transmission with shift paddles, and 4MATIC® all-wheel drive. Starting at $59,900, this three-row wagon offers seating for seven and up to 57.4 cubic feet of cargo space, as well as luxuries like multi-color ambient lighting and a power liftgate. Starting at $104,300, the AMG® E 63 S Wagon boasts am AMG® 5.5L biturbo V8 engine that dishes out 577 hp and 590 lb-ft of torque. You’ll find no shortage of comforts and conveniences, which include a panorama roof, PARKTRONIC® with Active Parking Assist, and KEYLESS GO®. Step Inside the Extraordinary 2017 E-Class! With its sophisticated styling and exciting comfort and safety concepts, the 2017 Mercedes-Benz E-Class promises a fresh luxury experience with a classic twist. 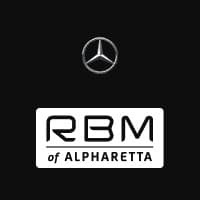 Arrange a test drive of the 2017 E-Class Coupe, Sedan, or Cabriolet, or a 2016 E-Class Wagon at RBM of Alpharetta, located at 345 McFarland Parkway in Alpharetta, GA. Our sales staff is standing by from 9 a.m. to 7 p.m. Monday through Friday, and from 9 a.m. to 6 p.m. on Saturday!